Heyhey! Welcome to the next instalment of ‘Becca experiments with a low-carb recipe despite loving carbs and never wanting to give them up’. Pasta, potatoes and bread will always, always be in my life (my first true loves), but occasionally it’s fun to try something different, and I really enjoyed this low-carb cauliflower tabbouleh! 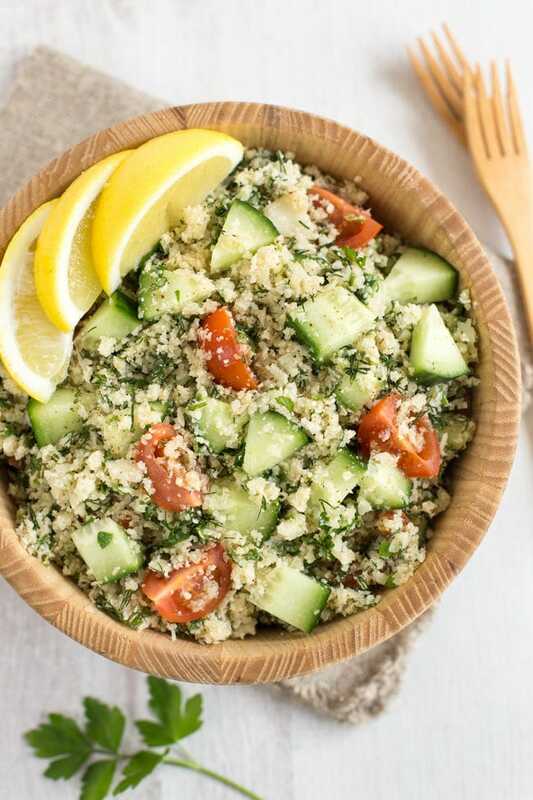 In case you don’t know, tabbouleh is usually made with bulgur wheat, but it’s only really there to bulk out the tasty bits – fresh cucumber and tomatoes, lemon juice, extra virgin olive oil, and plenty (plenty!) of fresh herbs. The vibrant flavours are gorgeous. So using cauliflower rice in place of the bulgur works really well – it’s not got a huge amount of flavour on its own, and is perfect to tie everything together. I used three kinds of herbs in my cauliflower tabbouleh – parsley, mint and dill. Parsley and mint are pretty traditional in tabbouleh; dill is not. But I had some in the fridge left over from my creamy dill and caper lentils, and I didn’t want it to go to waste. Tabbouleh is a brilliant way of clearing out any fresh herbs from your fridge – you can get through several big handfuls in one fell swoop! Similarly, feel free to add any other extras to your cauliflower tabbouleh that you like. Capers, olives, diced peppers, sun-dried tomatoes, whatever you fancy. They may not be traditional additions, but I’m always far less concerned with authenticity than I am with making a tasty meal, so I say add away. 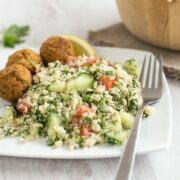 Since this low-carb cauliflower tabbouleh (like any other tabbouleh) is served cold, it makes a great lunchbox addition – or, go the whole hog and serve up a full Mediterranean-style mezze. I went somewhere in the middle, and served mine alongside some (not low-carb) falafel. A dollop of hummus or baba ganoush, tzatziki, stuffed vine leaves, or some grilled halloumi would all also be amazing accompaniments. This recipe makes a decent sized batch, so I’d recommend doing something a bit fancy at first, and then saving any leftovers for quick and easy lunches through the week. 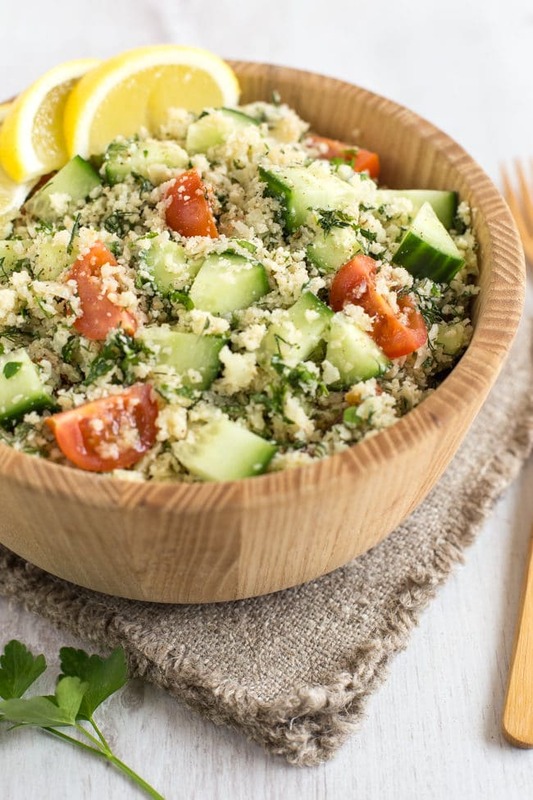 How do you feel about recipes like this low-carb cauliflower tabbouleh? 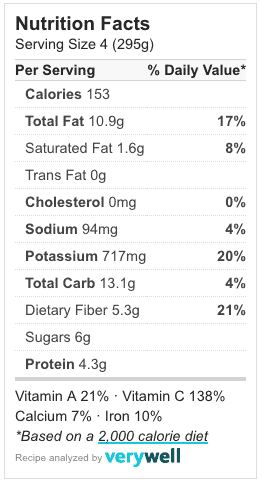 As I said, I don’t necessarily buy into a low-carb diet as a long-term solution for anything (I could definitely do with cutting down on my processed carbs, but don’t think there’s ever a reason to give up a whole food group in its entirety), but I do love trying new things for a change, and as far as I’m concerned this low-carb cauliflower tabbouleh was a big success! Cut the cauliflower into florets, and add them to a food processor. Blitz until no large lumps remain. Heat a dash of oil in a large frying pan or wok, and add the riced cauliflower. Cook over a medium heat for 5-10 minutes, stirring regularly, until the cauliflower rice starts to turn slightly golden brown. Set aside to cool. While the cauliflower is cooking, add the fresh herbs to the food processor (no need to wash it thoroughly beforehand), and blitz until the herbs are finely chopped. When the cauliflower rice has cooled, add it to a large mixing bowl, along with the finely chopped herbs, diced cucumber, tomatoes, lemon juice, olive oil, and a good pinch of salt and pepper. Mix thoroughly until well combined. Serve lightly chilled. 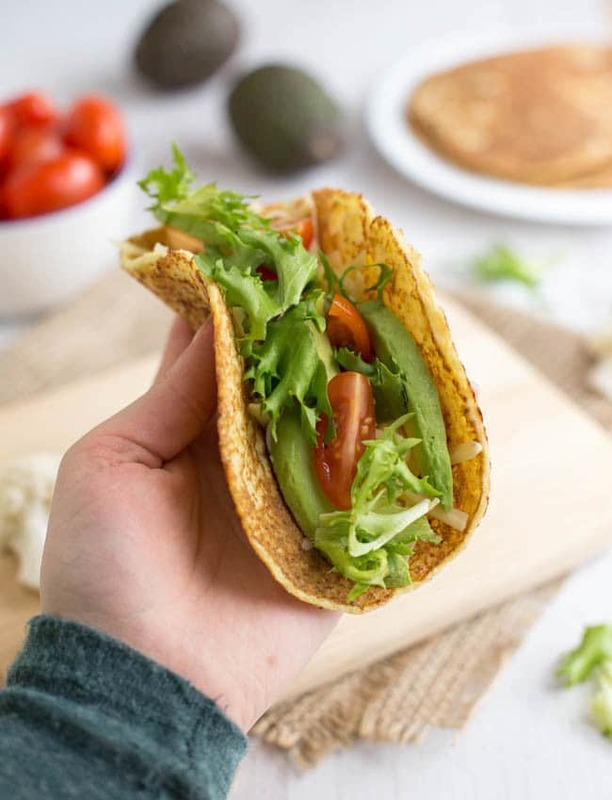 If you love using cauliflower as a low-carb alternative, try my cauliflower tortillas – only 57 calories and 2.5g of carbs per tortilla! Thanks Elinor! 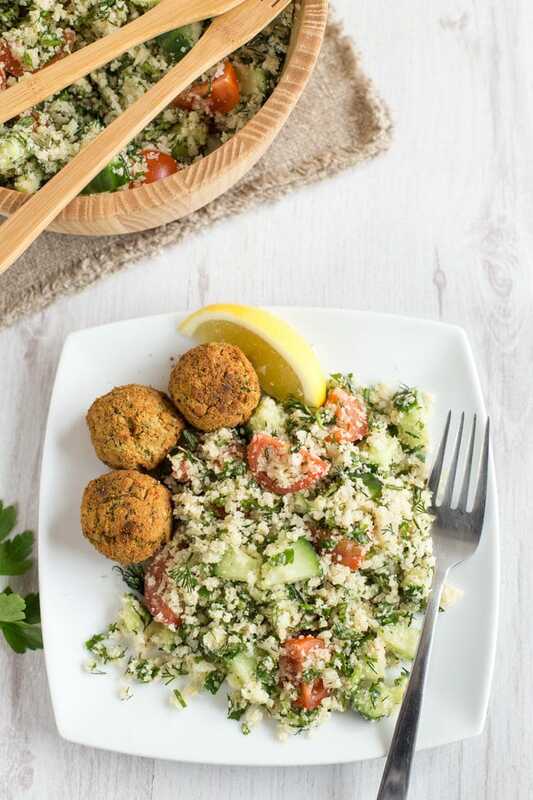 Tabbouleh is fab isn’t it – so fresh tasting. What a great idea. Isn’t cauliflower amazing?! So versatile and this is a great way to use up all sorts of herbs – I never seem to get through a whole packet and they end up going floppy at the back of the fridge. Will try this next time!! This is a favourite in our house too and just proof of how versatile cauliflower is. Always a good low carb alternative. 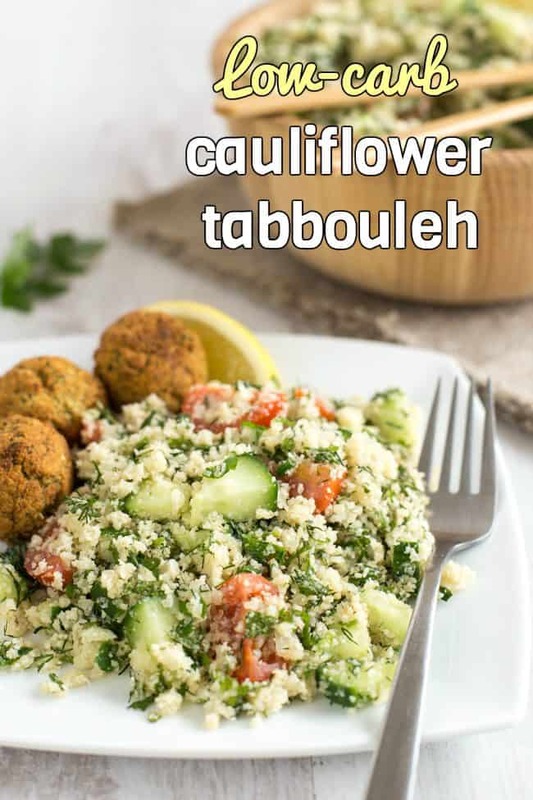 I love the sound of cauliflower in tabbouleh and especially with dill! Swapping out cauliflower for bulgur works so well in tabbouleh. You’re right the bulgur wheat is only there as a flavour carrier anyway so why not make it a low carb flavour carrier? Great recipe! 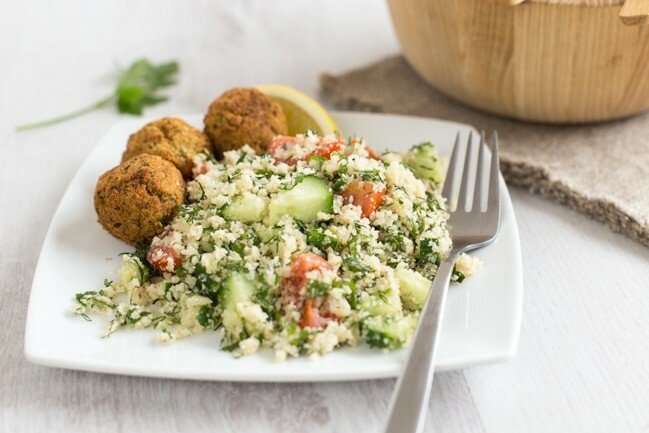 Making tabbouleh low-carb using cauliflower is brilliant! Becca, looks like a good refreshing light meal. I don’t know why but I have the urge to add some cheese on top too. I haven’t actually tried this yet but I was interested to see that the cauliflower is cooked. When I first saw it, I assumed that the cauliflower would be raw. I’m​ sure it would work either way and I look forward to trying both! It would definitely work with raw cauliflower too, I just personally prefer to cook the cauliflower rice a little first – it’s got a softer texture that way, and if you let it start to turn golden brown, it gets a slightly nutty flavour which I really like! I really like the idea of this, all the herbs in the tabbouleh will be so nice with the cauliflower.